Live L.A. Performance by three poets from New York City’s Three Rooms Press! 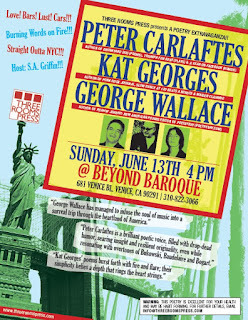 PETER CALAFTES, GEORGE WALLACE and KAT GEORGES, Plus, Host Extraordinaire: S.A. GRIFFIN!! 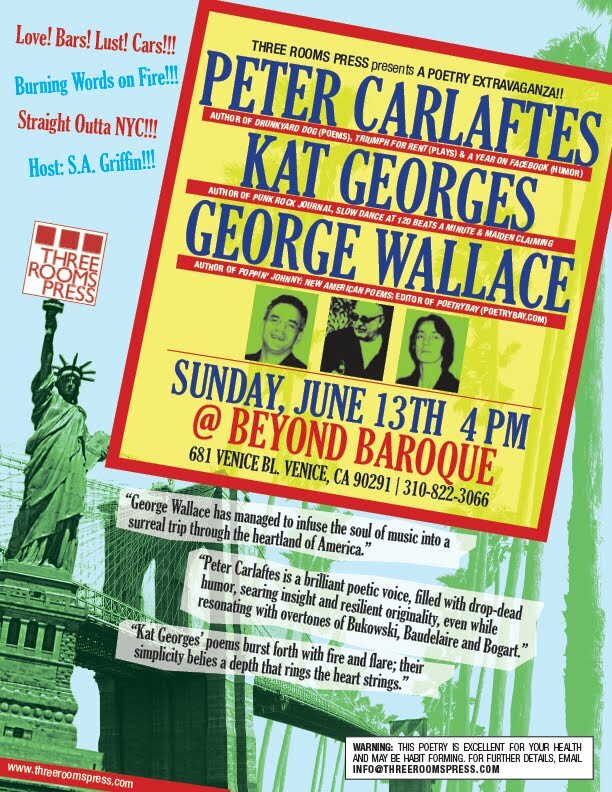 Sunday, June 13th, 4 p.m. at the incredible L.A. Poetry Institution Beyond Baroque (681 Venice Blvd, Venice, CA). PETER CARLAFTES, comic author, screenwriter, playwright, actor and poet, authored A Year on Facebook (humor), Triumph for Rent (3 Plays) and hot off the press—Drunkyard Dog (poems from both sides of the bar). GEORGE WALLACE, award winning poet and journalist, is author of Poppin’ Johnny: New American Poems along with 18 chapbooks. He’s also editor of poetrybay magazine (poetrybay.com) Poet/playwright KAT GEORGES has three collections of poetry, Punk Rock Journal, Maiden Claiming and Slow Dance at 120 Beats a Minute. She’s the founder and editor-in-chief of Three Rooms Press.